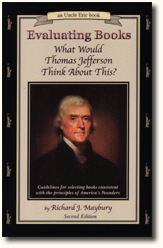 What Would Thomas Jefferson Think About This? This book offers many insights, it teaches principles of economics and government in bite-sized nuggets, and gives you indicators for spotting the hidden biases of news reporters, writers, movies and television. For educators, parents, librarians and anyone else responsible for making reading selections for children—including students themselves — Mr Maybury uses "indicators" and "misleading terms" to help individuals identify the philosophical slant of most writers of law, history, economics and literature.